Item # 317122 Stash Points: 295 (?) This is the number of points you get in The Zumiez Stash for purchasing this item. Stash points are redeemable for exclusive rewards only available to Zumiez Stash members. To redeem your points check out the rewards catalog on thestash.zumiez.com. Provide your skateboard, binder, laptop or any other flat surfaced belonging with a touch of DIY styling with the Open925 Midnight Arcade Sticker. 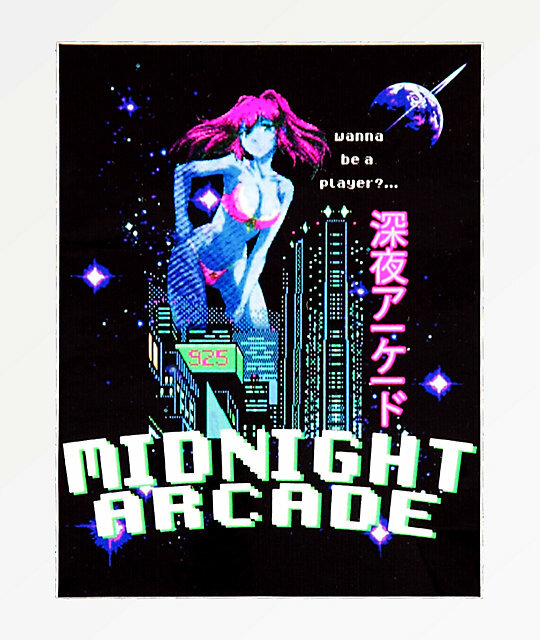 This accessory features a videogame-inspired city skyline, a girl in a bikini and the words "Midnight Arcade" in bold font. Midnight Arcade Sticker from Open925. Videogame-inspired city skyline, girl in bikini and script graphic. 3" x 4" | 8cm x 10cm (approx. ).